The white garlic is the more common garlic, and it ages well, but it's just not as picturesque. It's funny that garlic is so ubiquitous, because French food is not terribly garlicky. We go to the markets: lots of garlic. And people are buying it, too. We go to the restaurants: only a little garlic. We eat at a French person's home: virtually no garlic. Please explain. The pink version doesn't look any different when cooked into our food, and I'm not in the habit of putting whole heads of the stuff on my plate. However, it's got a slightly mellower, sweeter flavor, and it's absolutely gorgeous sitting in my veggie bowl in the kitchen. I feel that this is very confusing for vampires, vampire hunters, and those fearful of vampires. Is France a good place for the vampires? Or their foes? It's a mystery. 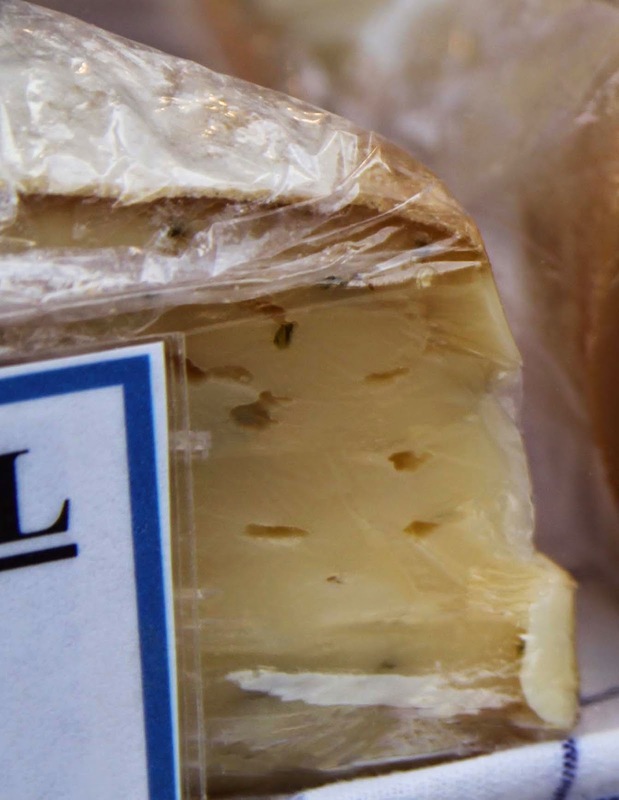 This cheese from Alasace, Tomme à l'Ail des Ours, translates as Cheese Wheel of Bears' Garlic. This doesn't mean that there's garlic in it. Actually, the cows feed on an herb called Bears' Garlic, also known as wild garlic (or, scientifically, Allium ursinum). It's in the Amaryllidaceae family. The cheese, made from raw cows' milk, is mild and somewhere between rubbery and soft. It's not bad, but it's not the most exciting of cheeses. Half a dozen of us tasted it, and not one of us could identify any hint of garlic at all. Which is too bad: It might have made the cheese more interesting. There's garlic in the name, but not much in the flavor. That pretty much sums our experience with garlic in France. But both the cheese and the garlic are pretty in their own way: one has an evocative name, the other is a very lovely garlic bulb, indeed.